Spanish colonial silver mate cup on a capstan base with a tapered, collared neck on a fluted body having a period script monogram: MER, c.1750. The fluted body is supported by a double capstan stem having a stud to secure it with a square silver nut to the large capstan base. Weighing 234 grams or 7.5 ozs. Troy, this desirable mate cup is 6 5/8" tall, with a base 2 3/8" in diameter and a cup 2 1/4" in diameter. Monogrammed as described above, the soft, warm, original finish is present, with no buffing or machine polishing. The excellent original condition and clear detail, with no removals, repairs or alterations, make this an especially attractive offering. 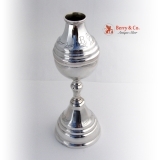 Spanish Colonial silver Mate cup having a stepped round cup with an octagonal collar with a beaded rim, c.1750. The cup has a period script monogram: B.Gh. The body and conforming pedestal base have engraved foliate decorations. 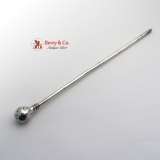 The baluster stem is a separate piece, being connected to the base through a long silver stud attached to the body secured with a square silver nut under the base. Weighing 203 grams or 6.5 ozs. Troy, this desirable Mate cup is 8" tall, 3" in diameter at the base and 2 1/2" in diameter at the cup. Monogrammed as described above, the soft, warm, original finish is present, with no buffing or machine polishing. The excellent original condition and clear detail, with no removals, repairs or alterations, make this an especially attractive offering. Spanish Colonial Mate cup, c.1750, having a bowl with engraved fan shaped decorations on the base a collared rim on the the tapered neck and a raised, stepped collar mid-body. 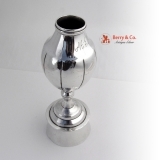 The separate capstan stem sits on a large, tapered stepped pedestal base, The body has a long silver stud that secures it and the stem to a fixed silver nut under the base. Weighing 225 grams or 7.2 ozs. Troy, this impressive Mate cup is 7 1/2" long, 3 1/4" in diameter at the base and 2 3/4" in diameter at the cup. The soft, warm, original finish is present, with no buffing or machine polishing. The excellent original condition and clear, crisp detail, with no monograms, removals, repairs or alterations, make this an especially attractive offering. 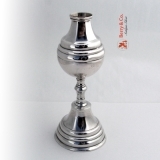 Spanish Colonial Silver Mate cup having an octagonal neck and a flared collar with a conforming pedestal base supported by a capstan stem. 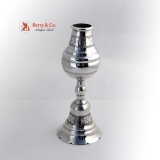 The cup has a long silver stud securing the base to the cup through the stem with an attached silver nut. The cup has a period script monogram with the first letter rubber and the other two being: ET, with the E being partially rubbed. weighing 209 grams or 6.7 ozs. Troy, this desirable Mate cup is 7 1/2" tall, 3 1/8" in diameter at the base and 2 1/2" in diameter at the cup. Monogrammed as described above, the soft, warm, original finish is present, with no buffing or machine polishing. The excellent original condition and clear detail, with no removals, repairs or alterations, make this an especially attractive offering. 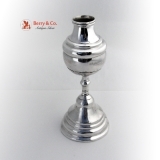 Spanish Colonial silver Mate cup with an engraved, tapered neck body and conforming pedestal base with a scalloped rim. The double capstan stem is supported by a silver stud on the body secured to an attached nut below the base. Weighing 215 grams or 6.9 ozs. Troy, this desirable Mate cup is 7" tall, 3" in diameter at the base and 2 1/4" in diameter at the cup. The soft, warm, original finish is present, with no buffing or machine polishing. The excellent original condition and clear, crisp detail, with no monograms, removals, repairs or alterations, make this an especially attractive offering. Spanish Colonial 900 - 925 standard Yerba Mate Bombilla or Tea Straw having an ornate, chased handle and a fluted pierced bowl with a collared faceted socket, c.1800. The end of the tube is notched, as is typical on old examples. 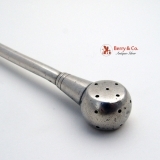 This antique Bombilla is 8 3/4" long and weighs 43 grams or 1.4 ozs. Troy. True, antique Bombillas are difficult to find. We have 3 other antique Bombillas listed.